Most of the settlers and leaders of early Marietta, Ohio, came from New England. But there was also a French connection as well. 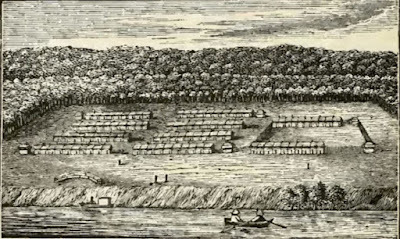 French explorer Celeron’ De Bienville led an expedition down the the Ohio River Valley in 1749. They buried engraved lead plates at the mouth of major tributaries (including the Muskingum River) to claim the land for France. Marietta was named for Marie Antoinette, Queen of France, in recognition of France’s support during the Revolutionary War. And, a group of French immigrants arrived in 1790 to settle on Ohio Company lands at Gallipolis (“city of the Gauls”). One of those immigrants who eventually ended up in Marietta was young Jean (usually appearing as “John”) Baptiste Regnier (“Zhon Bapteest RenYAY”). With access to good education in France, he was trained in architecture and medicine. The latter training would become his vocation years later. He was typical of many early Marietta pioneers: well educated, adventuresome, tolerant of severe frontier living conditions, and able to persevere through multiple setbacks. He ultimately became a successful doctor and civic-minded leader. Chaos gripped France as the French Revolution uprising began in 1789. 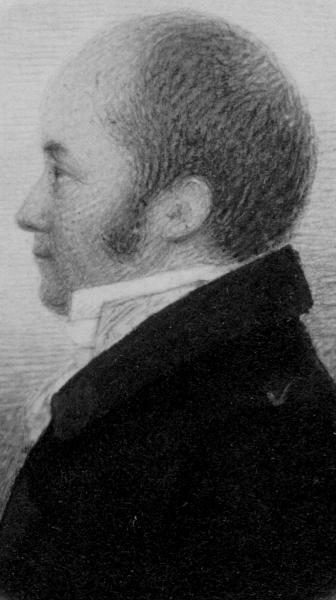 Young John Regnier, his parents, and siblings were loyal to the monarchy. They were all on edge as national resistance to the rule of the king and nobility gained momentum. There was rioting and civil unrest. Privileges of nobility and feudalism were abolished. The Regnier older children were being pressured to join the reformers.Their father feared for their well-being and made plans for all of the children to leave France for other countries. It so happened that land in America was then being offered for sale in France. That land, near present day Gallipolis, Ohio, was being sold by agents of the Scioto Company. Regnier’s father purchased land so that John Baptiste (then age 19) and his younger brother Modeste (age 14) could relocate there. About Six Hundred other French citizens also bought land. They sought a fresh start in America and escape from the French Revolution. However, moving from a comfortable life in France to the rugged Frontier in Ohio would be an unrelenting challenge - for the Regniers and the other French citizens. On many days, John lamented the decision to emigrate, especially because of the stress on his younger brother Modeste. They arrived at Alexandria, Virginia, in May 1790, weeks later than expected. More challenges lay ahead. The person who was to transport them to Ohio was a no show. Local residents helped them in the meantime. John was angered and dismayed to learn that the Scioto Company could not give them valid deeds for their land. The Scioto Company was a shameful example of land speculation. The agents including William Duer, Joel Barlow, and William Playfair (catch the irony of that name) used deceitful methods to sell American frontier land. The speculators used a technique appropriately called “dodging” - selling land they did not own. They took the buyers money but never paid the U S Treasury. The buyers ended up with nothing. It would make a great reality show today. Soil able to grow wheat, rye, barley, oats, indigo, tobacco, flax, hemp. Some of this was true, some not, and much was exaggerated. Cotton growing in Ohio? Really? 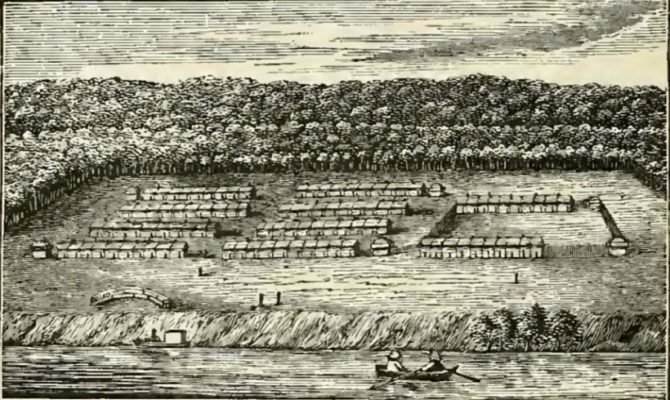 The Regniers and other French immigrants were eventually transported by wagon to Pittsburgh, then by boat down river to Marietta, then Gallipolis ("City of the Gauls," or "French City"), their new home. They arrived in October, 1790, nearly 10 months after leaving France. All were surprised, angered, and unprepared for the rough conditions. The flamboyant literature about their new home did not mention Indian threats, wilderness conditions, and isolation. Yet, they soon held a ball, complete with resplendent costumes and musical instruments brought with them. The Regnier brothers were hardy and adapted quickly. John used his architectural knowledge to build a small frame home, the first in Gallipolis. Other dwellings were log huts. They spent the next summer clearing about an acre of land. John Regnier pondered their future as the one year of free provisions from the Scioto Company ran out. Younger brother Modeste was petrified of Indian attacks and begged John to relocate. They decided to leave Gallipolis for New York via the Ohio River in February, 1792. A few miles up the river, their boat upset. All of their provisions were lost, and they were lucky to be alive. With no money, supplies, or food they continued on foot, barely able to survive the cold and facing starvation. They were sickened eating paw paw seeds. After several successful jobs and ventures, he again became destitute when a business agent failed to pay him. His thoughts turned to the beautiful Ohio valley. And his brother Modeste, who earlier begged to leave Ohio, now urged John to return there. John Baptiste Regnier decided to make medicine his vocation and to renew his medical training. He trained for a year with Doctor Lamoine of Washington PA who had come over from France on the same ship with the Regniers. Soon the John and his family again hit the road, moving from New York to Marietta. A local French baker, Monsieur Thierry, sold Regnier 100 acres along Duck Creek in Fearing Township. The area was then unsettled with few roads or bridges. Once more, he was in the wilderness, but “he was young and in the vigor of manhood, determined to do all he could for his family,” as historian Hildreth observed. Soon a log cabin was erected. Word got around that he was a doctor. Dr. Regnier, "the French Doctor," was in great demand from all directions. He made visits to people six or eight miles away - on foot. He was able to buy a horse after a while, making his rounds less strenuous. John Baptiste Regnier became legendary for his skill and manner. He rarely lost a patient, even to the prevalent and often fatal bilious fever. He was an excellent surgeon, repairing trauma injuries such as broken limbs. In one case, a man injured by a falling tree was cold to the touch and thought dead when Dr. Regnier arrived. He immediately ordered that a sheep be slaughtered and the skin removed. The man was wrapped in the still-warm sheepskin and soon revived. John’s finances improved. He started a mercantile business with his brother Francis who had moved to Marietta in 1809. But soon tragedy struck the family. John’s younger brother Modeste lived on same farm as John. Modeste became ill with bilious fever while John was in Wheeling buying inventory for the new store. By the time John returned, Modeste was seriously ill and died a day later. John was devastated by the loss, especially believing that he might have saved Modeste if he had been close by. The mercantile business thrived, and the Regniers moved to Marietta. He built a stately home and created beautiful gardens, which became an attractive model which others imitated. Soon he added a drug store as a business. His former patients continued to seek his attention, so that he remained fully occupied. Regnier was a leader as well, serving as a charter member of State of Ohio Medical Sociey board in 1812. He was elected a Washington County (Ohio) Commissioner in 1818. He moved again in 1819 - to Duck Creek, OH (now Macksburg) in northern Washington County. It seemed to be his passion to settle and develop new areas. Like his experiences in Gallipolis and Fearing Township, he worked at Duck Creek to develop what was a wilderness. Soon he had started a French Chateau-style home, erected flour and saw mills, and encouraged building of new roads. As Commissioner, he was instrumental in the creation of Aurelius Township, which was named for his youngest son, Aurelius. Macksburg was named for his son-in-law William Mackintosh who operated the first dry goods store there. Regnier helped design the new county courthouse built in 1822. John Baptiste Regnier died unexpectedly in the prime of life at age 52 in 1821 of bilious fever, the illness he had so often treated successfully in his patients. A carpenter working on the uncompleted home built a coffin, donated the land for a cemetery, and himself was the second to be buried there.